Markham, ON (July 27, 2018) – York 9 Football Club announced today that founding partner Jimmy Brennan will lead the the club as its first-ever Head Coach. As the Head Coach and Executive Vice President of Soccer Operations, the former Canada Men’s National Team star will oversee all soccer operations as the club prepares for the inaugural Canadian Premier League campaign in April 2019. Born in East York to Irish and Scottish parents, Brennan donned the Canadian Men’s National Team shirt on 50 occasions, including 49 senior national team appearances, where he scored six goals. He helped Canada to its successful capture of the 2000 CONCACAF Gold Cup and was inducted into the Canada Soccer Hall of Fame as a player in November 2015. His club career included stays at English outfits Bristol City, Nottingham Forest, Huddersfield Town, Norwich City and Southampton. Brennan was also the first player and captain for Toronto FC in its inaugural 2007 MLS campaign. Brennan also served as Executive Vice President and Director of Soccer at Aurora FC from March of 2015 to December of 2017. 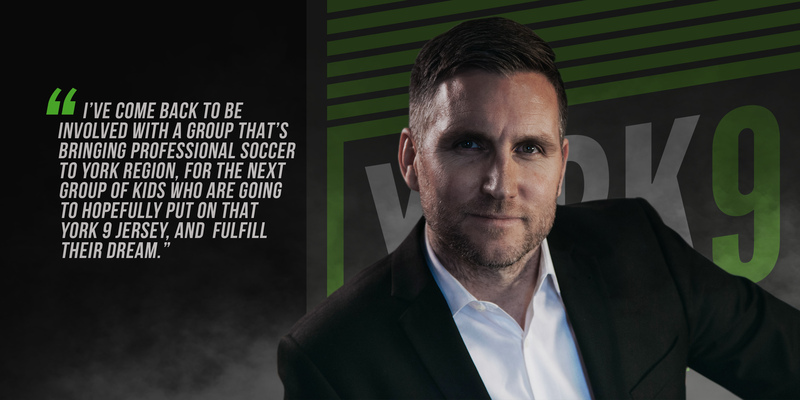 He returns to York Region to helm York 9 FC in the Canadian Premier League. York 9 FC is a proud member of the Canadian Premier League, which will begin play in April of 2019. Membership deposits can be made at york9football.club. Fans will be able to put down a $50 deposit to secure their place in line to become founding season ticket member.